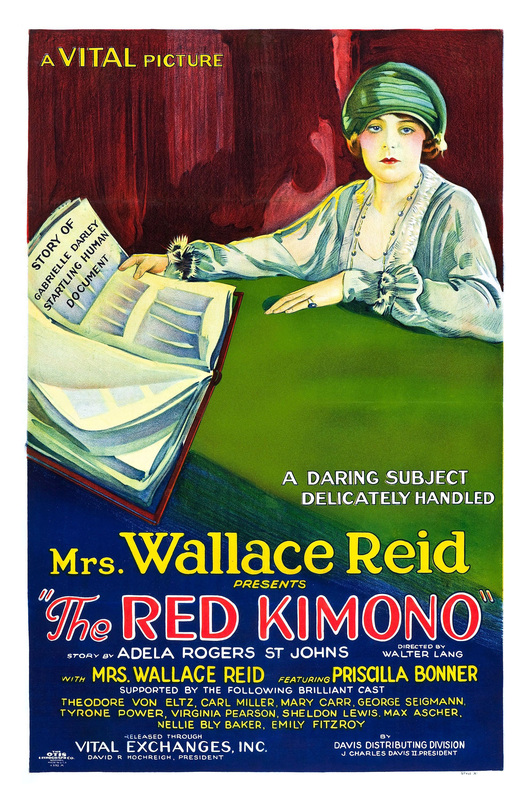 The Red Kimono (1925), a searing drama notably produced and written by women, captures a remarkably comprehensive visual record of early Los Angeles. From Broadway and posh gated communities to Chinatown and the amusement park piers, these settings, along with numerous stretches of still residential Wilshire Boulevard, and long lost jails, train stations, and skid row locales, all play pivotal roles in the film. [Special note: the movie is featured as part of the December 1, 2018 San Francisco Silent Film Festival Day of Silents program]. Based on real life events, Priscilla Bonner portrays Gabrielle, a naïve young woman betrayed by her lover in New Orleans, who forces her into prostitution. After finding the man later in Los Angeles, Gabrielle kills him, but her story of degradation is so compelling that she is acquitted. A seemingly kind society matron befriends Gabrielle, only to exploit Gabrielle’s notoriety in order to entertain her rich friends. The matron’s kindly chauffeur Frederick, portrayed by Theodore von Eltz, offers Gabrielle a second chance for love. Mrs. Wallace Reid, also known as Dorothy Davenport, independently produced the movie, while introducing the story on camera. Dorothy Arzner wrote the script from an original story by Adela Rogers St. Johns. Reid’s husband Wallace Reid was a well-known movie star for Famous Players-Lasky. Tragically, after being seriously injured in a job-related train accident, Wallace was only able to continue working with the aid of morphine. Mr. Reid eventually became addicted and died in 1923. The movie is available on DVD from Kino-Lorber. AND now on a beautiful razor sharp Blu-ray as part of the Pioneers: First Women Filmmakers box set (I wish I had time to upgrade all of the movie frames in this post). 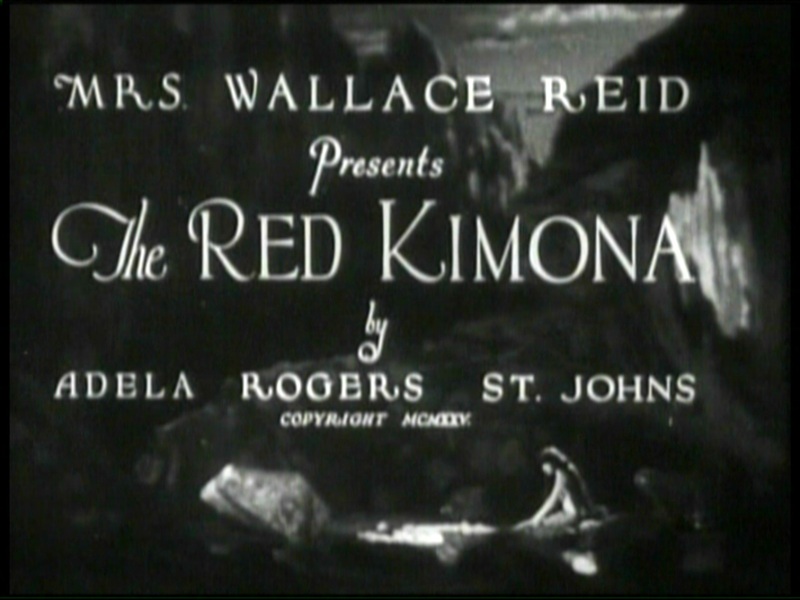 Confusingly, screen credits list the title as “The Red Kimona,” while advertisements from the day list it as “The Red Kimono.” Let’s start our 1925 journey across Los Angeles at Fremont Place, below. Upper right, Fred greets Gabriella on the steps of 53 Fremont Place. Due east behind them stands a home now lost, the former Aronson mansion at 31 Fremont Place. The home had been moved to Fremont Place in three sections. http://fremontplace.blogspot.com/2014/11/31-fremont-place-please-see-our.html Above, at the lower right, is a rare photo of the now lost home, viewed looking west. LAPL. The matron’s home, upper left, has two famous neighbors still standing to the south across the street. To the SW, 55 Fremont Place, appears in Charlie Chaplin’s The Kid (1921), see Edna Purviance lower left. The view from the matron’s home looking to the SE (upper right) shows 56 Fremont Place, the mansion where Mary Pickford once lived for a year in 1918, and that appears as Jean Harlow’s home in Bombshell (1933) (right center). The vintage aerial view, looking north, shows the three still surviving homes, the Red Kimono’s matron home at the center, with Edna filming The Kid to the left, and the Bombshell home to the right. The three landmark homes still grace Fremont Place. The surviving gates to Fremont Place appear in the movie and in Chaplin’s Idle Class (1921) (upper right). Fred takes Gabrielle on a date to the former Abbott Kinney Pier in Venice. Although they purchase tickets for the “Giant Dipper” roller-coaster, they filmed aboard the second “Some Kick” coaster at the far end of the pier. Marc Wanamaker – Bison Archives. Upper right, Gabrielle checks out the New High Street side of the former LA County Jail, fronting Temple Street, matching a similar view on New High Street from Max Linder’s Seven Years Bad Luck (1921). Fred learns Gabrielle is set to return to New Orleans. As he races to prevent her from reaching the train station, he drives east down Wilshire past the corner of Vermont, now the site of a modern highrise. USC Digital Library. Continuing east on Wilshire towards the Park Wilshire apartments on the corner of S. Carondelet, in the distance we see a “T” intersection, where Wilshire originally terminated at the west side of MacArthur (formerly Westlake) Park. Barely visible, dead center, is a trio of statues (see below). The trio of statues honors General Harrison Otis, the original founder/publisher of the Los Angeles Times. Buster Keaton (Hard Luck – 1921) filmed beside these statues, as did Billy West and Stan Laurel (not pictured). The aerial view looks east, showing where Wilshire once terminated at the west side of the park. USC Digital Library – LAPL. Further west (around Ardmore) but still looking east down Wilshire, this 1925 view shows the towering Gaylord Apartments (left), where still solo comedian Stan Laurel filmed On The Front Page (1926) (upper right), and the Talmadge Apartments (right), where Buster Keaton filmed Battling Butler (1925) (lower right). These lone towers are now hemmed in by numerous modern buildings. A vintage view north of the Gaylord, left, and Talmadge, right, along Wilshire. LAPL. The race to the train station continues east through the 3rd Street Tunnel, with Angels Flight appearing to the right. Angels Flight has since been relocated half a block further south. USC Digital Library. Now racing south down Broadway towards the intersection of 5th – the Title Guaranty Building at left, and Walker’s, the red corner building at right. Now we race east towards the original 1st Street Viaduct (re-built in 1929), before turning right on Santa Fe Avenue, past a billboard promoting train travel to Chicago. LAPL. Traveling south towards the former Santa Fe train station, an extremely popular filming site. Stan Laurel appears here in Hustling For Health (1919) (upper left). USC Digital Library. Gabrielle waiting beside the Santa Fe station. LAPL. Fred arrives at the station, but not in time to prevent Gabrielle from catching the train back home to New Orleans. USC Digital Library. Fred follows Gabrielle to “New Orleans,” where he pursues her by taxi departing south from the former Southern Pacific depot, on 5th at Central, near the former Santa Fe station. Fred’s taxi passes The New Orleans Market at right. This immediately caught my eye, as the other side of the corner market appears prominently in Harry Langdon’s comedy Long Pants (1927). The New Orleans Market stood at the former corner of Aliso and Los Angeles Street just south of the plaza. The (*) marks where Buster knocks out a policeman at this intersection in Cops (1922), and where Harry Langdon (above) also appeared, while the (**) marks Frederick’s taxi scene, filmed looking the opposite direction as shown in the aerial view. This area was all lost to the freeway. LAPL. Frederick’s taxi scene shows at back the south side of the former Hotel de Paris. Grabbed by a cop, Buster Keaton walked west, along the south side of the Hotel de Paris, during Neighbors (1920). LAPL. A broad aerial view looking east at the filming area south of the Plaza de Los Angeles (circle of trees at lower left). The former Chinatown (discussed below), demolished to build Union Station, lies due east of the plaza. The purple (*) marks Buster’s knockout shot in Cops (lower right), the yellow (*) marks Fred’s taxi, again filmed looking the other way. Upper right, Fred’s taxi stops at the corner of Alameda and Aliso – the orange (*). The view looks east towards the many gas tanks east of town. The far right green (*) marks the corner of Alameda and Ducommun, where Buster Keaton filmed many scenes from The Goat (1921), and this boxing glove turn, again from Cops, pictured here (lower right). Now in the former LA Chinatown (demolished for Union Station), the taxi turns right (south) from Apabalaza onto Juan Street. The doorway left of the pole appears beside Chaplin during Police (1915), showing the same pole. The taxi turned from right to left in the main photo, the same doorway and pole appear near the left center. El Pueblo Photo Archive. These matching views looks north up Juan towards the SE corner of Apablaza, the corner behind the car. Jackie Coogan appeared in Chaplin’s The Kid, in an opposing view, just around the same SE corner. The building across the street from Jackie appears in the three images directly above. USC Digital Library. Driving east along Marchesault Street towards Juan Street. The main photo looks west from Juan. El Pueblo Photo Archive. Where is this? It’s one of the few exteriors I couldn’t track down. The Red Kimono is a perfect example of how the movies can tell socially significant stories, while promoting the historic role women played in making films, but also how even a single movie can capture a vast and unique visual history of what is now almost entirely lost Los Angeles. Discovering this film was especially gratifying for me. Perhaps someday another treasure trove film will appear. The Red Kimono is available on DVD from Kino-Lorber. And now part of the First Women Filmmakers box set. This entry was posted in Uncategorized and tagged 1925 Los Angeles, 1925 Wilshire Boulevard, Angels Flight, Buster Keaton, Charlie Chaplin, Dorothy Arzner, Dorothy Davenport, Harry Langdon, Mrs. Wallace Reid, Priscilla Bonner, Silent Movie Locations, The Red Kimona, The Red Kimono, then and now. Bookmark the permalink. thanks for this — now I want to see the film — even if only for the locations! Great detective work. It’s going to be coming out in Blu-ray next Spring as part of Kino’s Pioneers: First Women Filmmakers. I hope extra details shine through. Great. Incredible sleuth work, Mr. Bengtson!! Excellent post, John. It’s really great to see all those locations tied together to so many films.